Mumbai: Hero Future Energies Pvt. Ltd is in talks to acquire Fotowatio Renewable Ventures’s 135 megawatt (MW) solar power project in India, two people aware of the development said. Owned by Abdul Latif Jameel Energy and Environmental Services, Fotowatio Renewables is the largest Arabian green energy utility. Its only investment in the Indian solar power space is located in Andhra Pradesh. Greenstone Energy Advisors, an investment bank focused on the Indian renewable energy sector, is managing the sale. Fotowatio Renewables was awarded the project in a reverse auction conducted by state-run Solar Energy Corp. of India (SECI) at a tariff of ₹4.43 per unit. In the renewable energy business, the biggest expense is the cost of capital. More so in India’s backdrop of record low renewable energy tariffs wherein the lowest ever solar tariffs of ₹2.44 per unit in reverse auctions was quoted in May 2017 for 200MW and again in July 2018 for 600MW. In comparison, the solar tariffs were ₹18 per unit in 2010. This has necessitated developers to raise resources at the lowest cost. Mint reported on 14 January about Japan’s Daiwa Securities Group Inc. being hired by Leap Green Energy Pvt. Ltd, promoted by the family of former Formula 1 driver Narain Karthikeyan, to raise funds from China, Japan and South Asian countries for its clean energy business. Queries emailed to the spokespersons of Fotowatio Renewable Ventures and Greenstone Energy Advisors on Tuesday evening remained unanswered. A Hero Future Energies spokesperson said, “As a policy we do not comment on market speculation." India’s renewable energy space has also seen consolidation in the backdrop of considerable overseas interest. The latest example is Malaysia’s Petronas initiating talks with New York-based I Squared Capital to buy a majority stake in Amplus Energy Solutions Pvt. Ltd, one of India’s largest rooftop solar power producers, in a deal potentially worth about ₹2,700 crore, as reported by Mint on Wednesday. India is ranked fifth globally in terms of installed renewable energy capacity, according to the government. India has a solar installed capacity of 24.33 gigawatts (GW), with another 22.8GW capacity under implementation, although there are concerns about the asset quality. 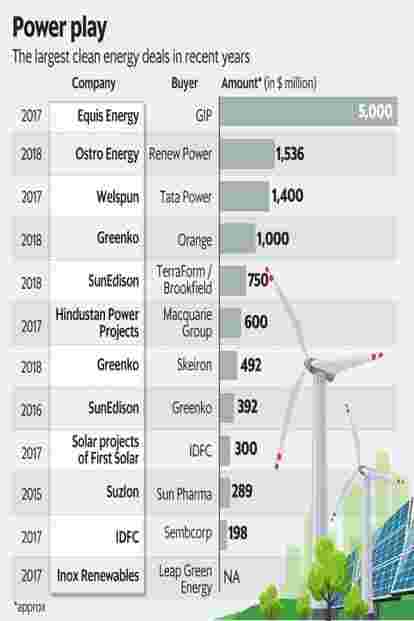 Some of the renewable energy deals in the works as reported by Mint are; PTC India Ltd’s wind power valued at around ₹2,000 crore that has seen interest from the Indian arm of CLP Holdings Ltd, Macquarie Infrastructure and Real Assets (MIRA) and Hero Future Energies. Also, half-a-dozen investors, including ReNew Power Ventures Pvt. Ltd and MIRA, are interested in acquiring the ₹5,000 crore renewable energy business of debt-laden Infrastructure Leasing and Financial Services Ltd (IL&FS).